Is there a residential fence company near me? Yes, Dakota Fence has offices located throughout the state of North Dakota. Our offices in Fargo, Minot, Bismarck, and Williston, ND service the entire state of North Dakota. Does Dakota Fence offer estimates during the winter months? Yes, by all means. Dakota Fence has the full capability coming out during the winter conditions, doing a complete site assessment and evaluation on what your fence needs might be. Please take a look at the different fence styles on our website styles. We have many available. We'd be happy to come out anytime during the winter, do a full estimate. The nice thing about the winter estimate is we can get you on the list right away. As soon as Spring rolls in, you'd be first on the list, and our professional crews would come out and immediately jump on your job and get it complete. That would give you the fence of your dreams to use all summer. Will Dakota Fence attend the North Dakota Home Show? Yes, Dakota Fence is always at all the home shows in all the cities. We'll be in Fargo, Bismarck, Dickinson, Williston, Minot, and Grant Forks. Please stop by the home show near you, take a look at our full line of fence products at our booth. We'll have our professional sales team there to answer and address any questions. We certainly would be more than happy to schedule an estimate, come out to your home, and do an assessment of the needs of your fence. Please do stop by at one of the home shows this coming season, we'd love to talk to you. Does Dakota Fence offer Fence Repair services? You bet, we'd be more than happy to come out, take an assessment of what your fence repair needs are. We've got a full professional crew. We can maintain and repair any fence of any type or nature, whether it's a swing gate, or a broken post, or a car backing into your fence. We'd love to help you out on any of your repairs that you've got in the future. We do the repair services for not only the residential, but the full commercial and industrial line. Please give us a call, we'd be more than happy to help you on your repair needs. What is the Dakota Fence Difference? We've been in business since 1972, and quite frankly we've watched the fence industry grow to what it is today. We have a full line of fence products. We only choose the very best in the industry. We've specifically chose the brands that we supply and install because of the quality, and the high end result, the appearance you get in your yard. All the jobs we do, we use our professional own crews to do the installation. We have our sales team on staff, fully capable of coming out to take a look at whatever your fence needs might be. We have every project, whether they're small or big. There's not a problem, we can take care of all of them. Does Dakota Fence have a customer service team or contact person? Yes, at Dakota Fence we have an awesome customer service support team. That's one of the things that separates us from many companies. From the initial sale, all the way through to the complete end dream fence in your backyard. Our support team can help you all the way through the process. Does Dakota Fence stand behind their work and fence products? Yes, Dakota Fence Stands behind all of our work and products. One big difference at Dakota Fence is we not only have the best industry fence products available, but we stand behind our fence. We've been in business since 1972. Our complete sales team, all the way through the installation side, and our professional installers really make the difference in why one would want to go and choose Dakota Fence over other companies. What should I expect when choosing to work with Dakota Fence? When you choose Dakota Fence to do your fenced installation, we bring to the team not only a complete professional product, but also the install team. The installation team we have takes no shortcuts, they've been with us for many, many years, we've been in business since 1972. The big difference is, when we complete the project, we take no shortcuts. You have a significant investment in your fence. It adds value to the home, and we want it to stand for many, many years. That's the biggest different with Dakota Fence over others. We've been in business, we know how to do it correct, and we take no shortcuts. Why does Dakota Fence use a steel post instead of the traditional concrete post on their fence products? Most of the wood fence always has used the wood post, or the concrete footing. In the recent years, we've went out and we actually have now supplied a steel post. The reasons you want to go with a steel post master post is, the life expectancy is years and years of maintenance for use. Unfortunately, the wood posts does rot eventually over time. With the high winds and the rotting, you don't get any of that with a post master. Moveing forward, the steel post is by far the best choice for longevity. With the investment you're putting in your yard, you don't want any maintenance. Can Dakota Fence modify and existing fence? Dakota Fence can come in and modify, or change, or add on to any existing fence of any style. We'd be more than happy to take a look at your needs. Please give us a call. Does Dakota Fence offer Bufftec Vinyl Fence products? BuffTech is a brand of maintenance free vinyl fence, it comes in an assortment of styles, and colors, and textures. The reason we've selected a BuffTech fence line as an exclusive here in our company, is because the BuffTech, is a maintenance free product, it has a lifetime warranty against fading, cracking, or any other imperfections. One unique thing about BuffTech is that not only were they the originator of the vinyl fence industry, but they also have a five year sure start program. What that basically is, is BuffTech will stand behind the product not only for the material defects, if ever. But, for the first five years, they will also pay for any warranty and labor to repair any issues in the product. BuffTech is really the leader, and Dakota Fence's exclusicve maintenance free vinyl fence choice. Does DFC have a showroom where we see life size samples of their fence products? Yes, Dakota Fence has an outside showroom in Fargo, Bismarck, Minot, and our Williston stores. The nice thing about our outside showroom is you can stop in after hours, during hours, weekends. It'll give you the ability to look at a life sized sample of any of it. Another nice thing about our outside showroom is you're actually going to see the finished product life size, in the real world. The weather conditions we have here in the Dakotas is brutal. You can see how it stands up, and you can look at it first hand. Whether it's the chain link, the aluminum, the vinyl, BuffTech, or our Trex Line. It gives you the chance to sit back and look at a lot of different styles in the full size that you can fit to your house. If you stop by our showroom, please come in. We'll help you. If not, we'd be more than happy to come out and do an onsite visit and show you all the different styles available that best suit what your needs are. Whether it's to contain kids or dogs, or you want just privacy. Can you walk me through the Dakota Fence, fence installation project? Once you've called Dakota Fence, we'd be more than happy to set up an estimate. Once the sales team arrives in your yard, takes a look at your fence project, and fits the fence of choice that meets your needs at your home. We take the project in house at that point. It's set up with our coordinator, a project folder's put together, and then they start the process of how to install your fence. Again, this whole process is a seamless process. The coordinator will call all utilities, so you the homeowner, you'll see prior to our fence installation, they will be giving you a date. Several days before that, you'll see some orange flags and marks on your ground, on the sod, or on the dirt. That's signifying all the utilities. Once that's in place, then our coordinator will talk to you a day in front of the crews arriving. They'll let you know, "Our foreman would meet you, take a once around the yard so we get all the gates and everything just where you want them." Any little things such as flower beds, or any other particulars that you have that we need to pay attention, we will. Once the crew is there, you're free to go about your business, go to work, whatever you need to do. Our professional team, been with us many, many years, they'll dig and set the job. Once the job is set and in the ground, we let it sit for two to three days, depending on weather conditions. Then at that point we have our finishing crew come in and finish it. Once our finishing crew is there and finishes it, it typically takes three to five workdays usually to do most yards. You really don't have to be on site, other than just give us a once around so we get everything laid out upfront. Then, we'll build the fence of your dreams. One of the nice things about Dakota Fence on choosing us to do your fence work is, we're a one stop. We make it so convenient, we take care of everything from utilities, to the permits you need in the different cities, to the complete end project. It's very simple. You don't have to be involved in it, that's our job. That's why we're different than others. We bring to the game not only a professional sales team, but the full professionalism all the way through to the end product. Does Dakota Fence offer custom gates? One of the big differences between Dakota Fence and any other fence company, is we have a full line of custom gates. They're fully designed here in house. They can be anything from a slide gate, to a swing gate, small or large opening. They can be manual, or electrically operated. Our company is one of the few that has a full line of technicians that do support the electronic, electric gate industry. You can open the gate from your house or remotely by an app. One of the things about the custom gates that's really exciting on our end is, we not only sit at the kitchen table with you, and help you draw up what it looks like. But, we bring to the game a full AutoCAD and design service. The entry gate to any home is an experience starting at the gate, as to what the inside of the home is like. It's very important that you do the right thing, and have the finishing touches at the gate because it sets the tone and the stage for the home that people are going to now see shortly. Does Dakota Fence Install Pool Fences? Here at Dakota Fence we can provide a fence for all your needs. Whether it's a pool enclosure, if you put a pool in, you're going to need to protect it with a fence. We know all the codes that are available in all the cities. We can do the pool fence. Or, you might have a young, young kids and need just the fence. We can assist you in choosing the fence that keeps the dog and the kids at home, or the pool enclosure. Does Dakota Fence Company sell Signs? Here at Dakota Fence Company, we have a full line of signs available. We manufacture signs, and they could be everything from a no parking sign, stop sign, to a custom sign that's unique to just your situation. We also have the steel posts, and a complete installation crew available whether it's city or rural. Does Dakota Fence Company sell No Hunting Signs? Dakota Fence Company sells no hunting signs available for all you ranch and Ag. people. They're a great product, you just put them up one time, and you never have to touch them again. Does Dakota Fence Offer After-Hours Estimates Free of Charge? Dakota Fence offers FREE After Hours Estimates. Simply click on the FREE Estimate link at the top of any of the website pages and fill out the form. One of our customer service team members will be in touch with you promptly to provide the free estimate. Does Dakota Fence install Bollards? Dakota Fence installs bollards on all commercial and industrial projects. They can be used for many things. To protect fire hydrants, to protect building corners, or just a simple overhead garage door bollard on each side of it. They can be made from round pipes, square pipe. They can be many coatings, powder coated, galvanized, or painted. Does Dakota Fence Company istall guard rail? Dakota Fence Company has the capability of installing guard rail, not only on parking ramps, and small city and municipal work. But, the oil field work, and any major industrial site. We have everything from plate beam, to box beam guard rail, guard rail ends, round guard rail. There's no guard rail project, big, little, or small, that we can't handle. Some are driven in, some are plate mounted on concrete. Please give us a call for any of your guard rail needs. Does Dakota Fence Company offer Custom Fabrication? At Dakota Fence we have a full fabrication shop. We employ certified welders, we can cut, roll, bend steel or aluminum. The unique thing about our custom fabrication shop is if you have any products or things that you want to make that are unique one off, we're the people that can do that for you. We have a full AutoCAD and design service available to assist you. We have a full capability of either painting, galvanizing, or powder coating the end product. We've made everything from small parts, to industrial parts. There's no project too big, or too small, or too unique. Please give us a call, we'd be more than happy to help you on your fabrication needs. Does Dakota Fence have a commercial and industrial line of gates? Dakota Fence carries a full line of commercial, industrial, slide gates. They're manufactured with the highest quality trucks and rollers. Most of those are electrically operated. We do have the manual available too, but we have a full line of industrial commercial slide gates, equipped with operators. All of our industrial commercial gate operators, and slide gates, and swing gates, are maintenance free. Dakota Fence has the full line of aluminum Dakota gates. It's a specially designed gate that can take the elements. It's a maintenance free track and truck system. Many, many years of service. The life cycles can be very minute. Most of the gates are electrically operated. We offer a full line of Linear Osco gate operator equipment. The access control equipment that you might have in your building are capable of tying into our gates. We offer a complete line of gates, whether swing or slide. Does Dakota Fence offer any pre-stained wood fence options? Yes, Dakota Fence offers spruce wood fence that is pre-stained as an option. The spruce comes in three separate colors. They're pre-stained, so you don't have to do any staining. Once we come in, we put the fence up, you're all done. The staining is complete. Whereas the cedar, most people let it takes its natural state. Why is the Western Red Cedar Wood Fence better than other wood fences? One of the reasons Dakota Fence selected the Western Red Cedar Wood Fence out of the Northwest as our wood fence option, is because it has the rot resistant characteristics in the fiber of the wood. That's why we don't use pine, or any other products of that type. Do you find the property lines? Dakota Fence is not responsible for property lines—it is the homeowner’s responsibility to locate property lines. However, you can check your local city’s website to see if they have GIS maps to help you locate your property boundaries. Do you call for public utilities? Dakota Fence locates public utilities. Private utilities are the responsibility of the homeowner. Estimates are always free and Dakota Fence will gladly assist in helping you decide what is best for your needs. What types of fences do you offer? We offer all types of fence; chain link, wood (cedar), vinyl/PVC, Aluminum, Composite and Simtek. We also offer a full line of Commercial products. We follow all Manufacture’s Warranties and we offer 1 year on Labor and Material for chain link and cedar. Dakota Fence has multiple color options in a variety of different styles of fence. Please check out the style you are interested in for the selection of colors. How long has Dakota Fence been in business? 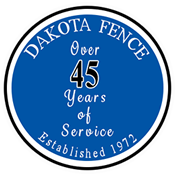 Dakota Fence is a family run business started in 1972! It will depend on the city you live in. Contact your city’s planning and zoning department to find out. Does Dakota Fence use subcontractors? No. Dakota Fence hires and trains all of our employees. What is the typical lead time/install time? The average lead time is 2-3 weeks depending on time of year and the product you have chosen. Install time is, on average, about 5 days. If your project has specific needs or deadlines we will work to accommodate. Please call and confirm with any questions regarding this area. What are some factors I should consider on the location of my fence? Some things to consider are: property lines, utilities, easements and any other objects that may impede your new fence. Yes. We also offer payment by credit card. Do you remove old/existing fences? Dakota Fence can and will remove your old/existing fence. Do you have an outdoor showroom where I can see samples? Yes, we have outdoor showrooms at each of our locations. Dakota Fence is the largest full line fence and specialty contractor in the Upper Midwest. 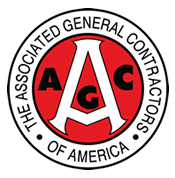 We have installed thousands of Residential and Commercial projects locally and continue to grow. Do you use recycled materials in your vinyl fences? Most PVC fence product on the market today utilize recycled plastics and can have an appealing price tag. More often than not, these products will eventually will become brittle, yellow, fade, and crack. Choosing a Bufftech vinyl fence for your home is an investment and before you buy a recycled resin fence, we invite you to stop by one of our showrooms or call and talk to one of our estimators to find out why a Bufftech vinyl fence is right for your property.